The United States Air Force is without a doubt exactly what its name suggests, a force which time and again proves itself worthy of possessing a multitude of military challenge coins. Custom challenge coins designed for the Air Force reflect their solid roots in integrity, service and excellence. The U.S. Air Force prides itself in its rapid global mobility and attack methods as well as information superiority, precision engagement and combat support. 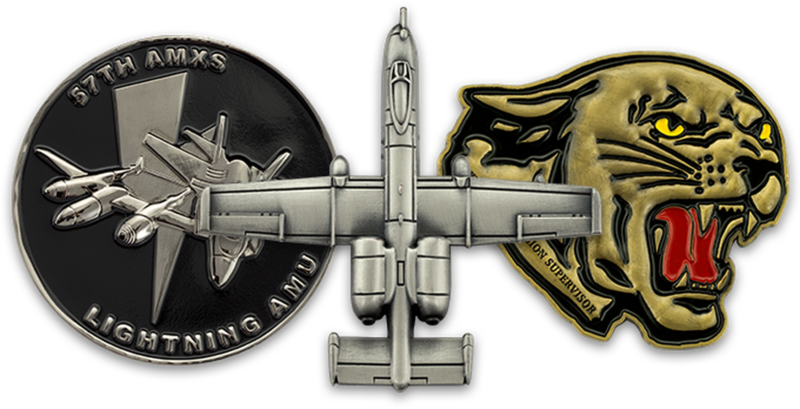 In fact, to limit Air Force tactics to air assault would be an insult to the branch and this has become evident through the various design elements seen in custom Air Force challenge coins. When all forces of the branch are combined, it maintains an extreme advantage over enemy operations in the air, sea, space and on land, all of which are accomplishments that challenge coins are made to honor. No matter the occasion, achievement, location or group one may be a part of during their Air Force times, a leading manufacturer of U.S. challenge coins, like U.S. DOD Coins, is the only company truly qualified to meet your Air Force challenge coin needs. Unmatched quality, exclusive offers and discounts combined with many design choices and unlimited revisions for your custom coin make it easy for your unit or department to not only create their very own challenge coin, custom to fit to its unique needs, but to also see why we have become the exclusive challenge coin maker for all things military.